Hunger, and the poverty that often causes it, has long been perceived as a third-world problem. Yet widespread unemployment and rising food costs are just part of the cause for an epidemic here in the United States. For example, last year the Poverty Research Institute reported that one out of every five New Jersey families did not earn enough to afford basic necessities such as food, housing and child care, even though 85 percent of these families have at least one working family member. 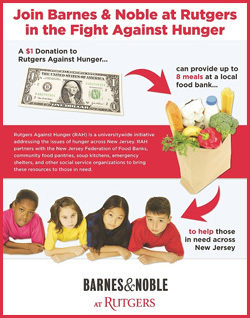 Statistics like these led Rutgers University to establish Rutgers Against Hunger (RAH) in 2008 – and Barnes & Noble College is a valuable ally in the fight. 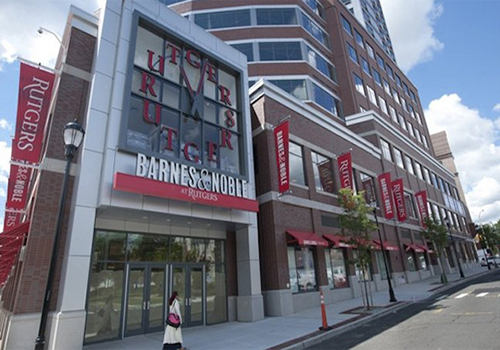 Rutgers School of Arts and Sciences junior, Johnny Malpica donates a dollar to cashier Allison Bittner, a School of Arts and Sciences senior, for the Rutgers Against Hunger fund at the Barnes & Noble at Rutgers Bookstore. 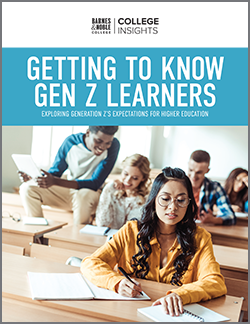 Students are encouraged to donate a dollar when checking out with their textbooks in a program that is also promoted on the bookstore Facebook page and through signage throughout the store. 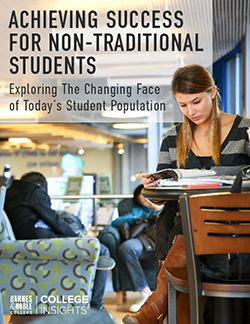 “Many of our students are not shy about donating to causes they believe in, and in many cases, it’s more than a dollar,” Oser says. A single dollar donation raised throughout the one-month fund drive can provide up to eight meals at a local food bank, and donors receive a bookmark thanking them for their contributions. 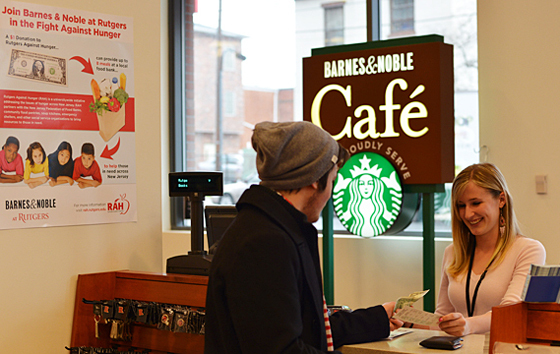 Visitors to the Barnes & Noble Café can also make donations. “We ask anyone who’d like to make a donation to consider a contribution to RAH because it is such a worthy cause,” Oser points out. Since its inception, RAH has collected over 124,000 pounds of food and raised approximately $136,000 for food banks and pantries statewide. Through a partnership with the New Jersey Federation of Food Banks, Rutgers’ contributions are put to work at over 1,500 local pantries throughout the state.